In my previous blog, I briefly discussed what bot managers are and why they are needed. Today, we will conduct a short ROI exercise (perhaps the toughest task in information security!). To recap: Bots generate a little over half of today’s internet traffic. Roughly half of that half (i.e. a quarter, for rusty ones like myself…) is generated by bad bots, a.k.a. automated programs targeting applications with the intent to steal information or disrupt service. Over the years, they have gotten so sophisticated, they can easily mimic human behavior, perform allegedly uncorrelated violation actions and essentially fool most of application security solutions out there. These bots affect each and every arm of your business. If you are in the e-commerce or travel industries, no need to tell you that… if you aren’t, go to your next C-level executive meeting and look for those who scratch their heads the most. Why? Because they can’t understand where the money goes, and why the predicted performance didn’t materialize as expected. Let’s go talk to these C-Suite executives, shall we? Imagine you are selling product online–whether that’s tickets, hotel rooms or even 30-pound dog food bags–and this is your principal channel for revenue generation. Now, imagine that bots act as faux buyers, and hold the inventory “hostage” so genuine customers can not access them. Sure, you can elapse the process every 10 minutes, but as this is an automated program, it will re-initiate the process in a split second. And what about CAPTCHA? Don’t assume CAPTCHA will weed out all bots; some bots activate after a human has solved it. How would you know when you are communicating with a bot or a human? (Hint: you’d know if you had a bot management solution). Wondering why the movie hall is empty half the time even though it’s a hot release? Does everybody go to the theater across the street? No. Bots are to blame. And they cause direct, immediate and painful revenue loss. Digital marketing tools, end-to-end automation of the customer journey, lead generation, and content syndication are great tools that help CMOs measure ROI and plan budgets. But what if the analysis they provide are false? What if half the clicks you are paying for are fictitious, and you were subject to a click-fraud campaign by bots? What if a competitor uses a bot to scrape data of registrants out of your landing pages? Unfortunately, bots often skew the analysis and can lead you to make wrong decisions that result in poor performance. Without bot management, you’re wasting money in vain. Does your team complain that your network resources are in the “red zone,” close to maximum performance, but your customer base isn’t growing at the same pace? Obviously some bots are “good,” like automated services that help accelerate and streamline your business, analyze data quickly and help you to make better decisions. However, bad bots (26% of the total traffic you are processing) put a load on your infrastructure and make your IT staff cry for more capacity. So you invest $200-500K in bigger firewalls, ADCs, and broader internet pipes, and upgrade your servers. Next thing you know, a large DDoS attack from IoT botnets knocks everything down. If only you had invested $50k upfront to filter out the bad traffic from the get-go… That could’ve translated to $300k cash back! Every hour, a new security vendor knocks on your door with another solution for a 0.0001% probability what-if scenario… your budget is all over the place, spent on multiple protections and a complex architecture trying to take an actionable snapshot of what’s going on at every moment. At the end of the day, your task is to protect your company’s information assets. And there are so many ways to get a hold of those precious secrets! Bad bots are your enemy. They can scrape content, files, pricing, and intellectual property from your website. They can take over user accounts by cracking their passwords or launch a credential stuffing attack (and then retrieve their payment info). And they can take down service with DDoS attacks and hold up inventory, as I previously mentioned. You can absolutely reduce these risks significantly if you could distinguish human versus bot traffic (remember, sophisticated bots today can mimic human behavior and bypass all sorts of challenges, not only CAPTCA), and more than that, which bot is legitimate and which is malicious. Bot management equals less risk, better posture, stable business, no budget increases or unexpected expenses. Cash back! Your management peers could have made better investments, but now you have to clean up their mess. This can include paying legal fees and compensation to customers whose data was compromised, paying regulatory fines for coming up short in compliance, shelling out for a crisis management consultant firm, and absorbing costs associated with inventory hold up and downed service. If you only had a bot management solution in place… so much cash back. Run–do not walk–to your CEO and request a much-needed bot management solution. Not only does s/he have nothing to lose, s/he has a lot to gain. * This week, Radware integrates bot management service with its cloud WAF for a complete, fully managed, application security suite. Roughly half of today’s internet traffic is non-human (i.e., generated by bots). While some are good—like those that crawl websites for web indexing, content aggregation, and market or pricing intelligence—others are “bad.” These bad bots (roughly 26% of internet traffic) disrupt service, steal data and perform fraudulent activities. And they target all channels, including websites APIs and mobile applications. Bots represent a problem for businesses, regardless of industry (though travel and e-commerce have the highest percentage of “bad” bot traffic). Nonetheless, many organizations, especially large enterprises, are focused on conventional cyber threats and solutions, and do not fully estimate the impact bots can have on their business, which is quite broad and goes beyond just security. Your CMO is dazzled by analytic tools and affiliate services skewed by malicious bot activity, leading to biased decisions. For those organizations that do focus on bots, the overwhelming majority (79%, according to Radware’s research) can’t definitively distinguish between good and bad bots, and sophisticated, large-scale attacks often go undetected by conventional mitigation systems and strategies. To complicate matters, bots evolve rapidly. They are now in their 4th generation of sophistication, with evasion techniques so advanced they require the most powerful technology to combat them. Generation 3 – These bots use full-fledged browsers and can simulate basic human-like patterns during interactions, like simple mouse movements and keystrokes. This behavior makes it difficult to detect; these bots normally bypass traditional security solutions, requiring a more sophisticated approach than blacklisting or fingerprinting. Generation 4 – These bots are the most sophisticated. They use more advanced human-like interaction characteristics (so shallow-interaction based detection yields False Positives) and are distributed across tens of thousands of IP addresses. And they can carry out various violations from various sources at various (random) times, requiring a high level of intelligence, correlation and contextual analysis. Organizations must make an accurate distinction between human and bot-based traffic, and even further, distinguish between “good” and “bad” bots. Why? Because sophisticated bots that mimic human behavior bypass CAPTCHA and other challenges, dynamic IP attacks render IP-based protection ineffective, and third and fourth generation bots force behavioral analysis capabilities. The challenge is detection, but at a high precision, so that genuine users aren’t affected. To ensure precision in detecting and classifying bots, the solution must identify the intent of the attack. Yesterday, Radware announced its Bot Manager solution, the result of its January 2019 acquisition of ShieldSquare, which does just that. By leveraging patented Intent-based Deep Behavior Analysis, Radware Bot Manager detects the intent behind attacks and provides accurate classifications of genuine users, good bots and bad bots—including those pesky fourth generation bots. Learn more about it here. The S in HTTPS is supposed to mean that encrypted traffic is secure. For attackers, it just means that they have a larger attack surface from which to launch assaults on the applications to exploit the security vulnerabilities. How should organizations respond? Most web traffic is encrypted to provide better privacy and security. By 2018, over 70% of webpages are loaded over HTTPS. Radware expects this trend to continue until nearly all web traffic is encrypted. The major drivers pushing adoption rates are the availability of free SSL certificates and the perception that clear traffic is insecure. While encrypting traffic is a vital practice for organizations, cyber criminals are not necessarily deterred by the practice. They are looking for ways to take advantage of encrypted traffic as a platform from which to launch attacks that can be difficult to detect and mitigate, especially at the application layer. As encrypted applications grow more complex, the potential attack surface is larger. Organizations need to incorporate protection of the application layer as part of their overall network security strategies. Results from the global industry survey revealed a 10% increase in encrypted attacks on organizations by 2018. When planning protection for encrypted applications, it is important to consider all of the layers that are involved in delivering an application. It is not uncommon for application owners to focus on protecting the encrypted application layer while overlooking the lower layers in the stack which might be vulnerable. In many cases, protection selected for the application layer may itself be vulnerable to transport-layer attacks. applications from attacks on the TCP layer. Some applications now use QUIC, which uses UDP as the underlying layer and adds reflection and amplification risks to the mix. Session — The SSL itself is vulnerable. Once an SSL/TLS session is created, the server invests about 15 times more compute power than the client, which makes the session layer particularly vulnerable and attractive to attackers. Application — Application attacks are the most complex type of attack, and encryption only makes it harder for security solutions to detect and mitigate them.Attackers often select specific areas in applications to generate a high request-to-load ratio, may attack several resources simultaneously to make detection harder, or may mimic legitimate user behavior in various ways to bypass common application security solutions.The size of an attack surface is determined by the application design. For example, in a login attack, botnets perform multiple login attempts from different sources to try to stress the application. The application login is always encrypted and requires resources on the application side such as a database, authentication gateway or identity service invocation. The attack does not require a high volume of traffic to affect the application, making it very hard to detect. Organizations also need to consider the overall environment and application structure because it greatly affects the selection of the ideal security design based on a vulnerability assessment. Content Delivery Network — Applications using a content delivery network (CDN) generate a challenge for security controls which are deployed at the origin. Technologies that use the source IP for analyzing client application behavior only see the source IP of the CDN. There is a risk that the solutions will either over mitigate and disrupt legitimate users or become ineffective. High rates of false positives prove that protection based on source IP addresses is pointless. Instead, when using a CDN, the selected security technology should have the right measures to analyze attacks that originate behind it, including device fingerprinting or extraction of the original source from the application headers. Application Programming Interface — Application programming interface (API) usage is common in all applications. According to Radware’s The State of Web Application Security report, a third of attacks against APIs intends to yield a denial-of-service state. The security challenge here comes from the legitimate client side. Many solutions rely on various active user validation techniques to distinguish legitimate users from attackers. These techniques require that a real browser reside at the client. In the case of an API, many times a legitimate browser is not at the client side, so the behavior and legitimate response to various validation challenges is different. Mobile Applications — Like APIs, the client side is not a browser for a mobile application and cannot be expected to behave and respond like one. Mobile applications pose a challenge because they rely on different operating systems and use different browsers. Many security solutions were created based on former standards and common tools and have not yet fully adapted. The fact that mobile apps process a high amount of encrypted traffic increases the capacity and security challenges. Directionality — Many security solutions only inspect inbound traffic to protect against availability threats. Directionality of traffic has significant implications on the protection efficiency because attacks usually target the egress path of the application. In such cases, there might not be an observed change in the incoming traffic profile, but the application might still become unavailable. An effective security solution must process both directions of traffic to protect against sophisticated application attacks. Major selection criterion for security solutions is regulatory compliance. In the case of encrypted attacks, compliance requirements examine whether traffic is decrypted, what parts of traffic are decrypted and where the decryption happens. The governing paradigm has always been that the more intrusive the solution, the more effective the security, but that is not necessarily the case here. Solutions show different levels of effectiveness for the same intrusiveness. The encryption protocol in use has implications toward how security can be applied and what types of vulnerabilities it represents. Specifically, TLS 1.3 generates enhanced security from the data privacy perspective but is expected to generate challenges to security solutions which rely on eavesdropping on the encrypted connection. Users planning to upgrade to TLS 1.3 should consider the future resiliency of their solutions. Determining attack patterns is the most important undertaking that organizations must master. Because there are so many layers that are vulnerable, attackers can easily change their tactics mid-attack. The motivation is normally twofold: first, inflicting maximum impact with minimal cost; second, making detection and mitigation difficult. Distribution — The level of attack distribution is very important to the attacker. It impacts the variety of vectors that can be used and makes the job harder for the security controls. Most importantly, the more distributed the attack, the less traffic each attacking source has to generate. That way, behavior can better resemble legitimate users. Gaining control of a large botnet used to be difficult to do and extremely costly. With the growth in the IoT and corresponding IoT botnets, it is common to come across botnets consisting of hundreds of thousands of bots. Overall Attack Rates — The overall attack traffic rate varies from one vector to another. Normally, the lower the layer, the higher the rate. At the application layer, attackers are able to generate low-rate attacks, which still generate significant impact. Security solutions should be able to handle both high- and low-rate attacks, without compromising user experience and SLA. Rate per Attacker — Many security solutions in the availability space rely on the rate per source to detect attackers. This method is not always effective as highly distributed attacks proliferate. Connection Rates — Available attack tools today can be divided into two major classes based on their connection behavior. The first class includes tools that open a single connection and generate many. The second includes tools that generate many connections with only a single request or very few requests on each connection. Security tools that can analyze connection behavior are more effective in discerning legitimate users from attackers. Session Rates — SSL/TLS session behavior has various distinct behavioral characteristics in legitimate users and browsers. The major target is to optimize performance and user experience. Attack traffic does not usually fully adhere to those norms, so its SSL session behavior is different. The ability to analyze encryption session behavior contributes to protecting both the encryption layer and the underlying application layer. Application Rates — Because the application is the most complex part to attack, attackers have the most degree of freedom when it comes to application behavior. Attack patterns vary greatly from one attack to another in terms of how they appear on application behavior analyses. At the same time, the rate of change in the application itself is very high, such that it cannot be followed manually. Security tools that can automatically analyze a large variety of application aspects and, at the same time, adapt to changes quickly are expected to be more effective in protecting from encrypted application attacks. Protection from encrypted availability attacks is becoming a mandatory requirement for organizations. At the same time, it is one of the more complex tasks to thoroughly perform without leaving blind spots. When considering a protection strategy, it is important to take into account various aspects of the risk and to make sure that, with all good intentions, the side door is not left open. Whether you’re an executive or practitioner, brimming with business acumen or tech savviness, your job is to preserve and grow your company’s brand. Brand equity relies heavily on customer trust, which can take years to build and only moments to demolish. 2018’s cyber threat landscape demonstrates this clearly; the delicate relationship between organizations and their customers is in hackers’ cross hairs and suffers during a successful cyberattack. Make no mistake: Leaders who undervalue customer trust–who do not secure an optimized customer experience or adequately safeguard sensitive data–will feel the sting in their balance sheet, brand reputation and even their job security. Radware’s 2018-2019 Global Application and Network Security report builds upon a worldwide industry survey encompassing 790 business and security executives and professionals from different countries, industries and company sizes. It also features original Radware threat research, including an analysis of emerging trends in both defensive and offensive technologies. Here, I discuss key takeaways. Without question, cyberattacks are a viable threat to operating expenditures (OPEX). This past year alone, the average estimated cost of an attack grew by 52% and now exceeds $1 million (the number of estimations above $1 million increased 60%). For those organizations that formalized a real calculation process rather than merely estimate the cost, that number is even higher, averaging $1.67 million. Despite these mounting costs, three in four have no formalized procedure to assess the business impact of a cyberattack against their organization. This becomes particularly troubling when you consider that most organizations have experienced some type of attack within the course of a year (only 7% of respondents claim not to have experienced an attack at all), with 21% reporting daily attacks, a significant rise from 13% last year. Repercussions can vary: 43% report a negative customer experience, 37% suffered brand reputation loss and one in four lost customers. The most common consequence was loss of productivity, reported by 54% of survey respondents. For small-to-medium sized businesses, the outcome can be particularly severe, as these organizations typically lack sufficient protection measures and know-how. Direct costs: Extended labor, investigations, audits, software patches development, etc. As the cost of cyberattacks grow, so does the complexity. Information networks today are amorphic. In public clouds, they undergo a constant metamorphose, where instances of software entities and components are created, run and disappear. We are marching towards the no-visibility era, and as complexity grows it will become harder for business executives to analyze potential risks. The increase in complexity immediately translates to a larger attack surface, or in other words, a greater risk exposure. DevOps organizations benefit from advanced automation tools that set up environments in seconds, allocate necessary resources, provision and integrate with each other through REST APIs, providing a faster time to market for application services at a minimal human intervention. However, these tools are processing sensitive data and cannot defend themselves from attacks. 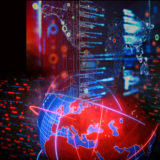 The report found that the primary goal of cyber-attacks is service disruption, followed by data theft. Cyber criminals understand that service disruptions result in a negative customer experience, and to this end, they utilize a broad set of techniques. Common methods include bursts of high traffic volume, usage of encrypted traffic to overwhelm security solutions’ resource consumption, and crypto-jacking that reduces the productivity of servers and endpoints by enslaving their CPUs for the sake of mining cryptocurrencies. Indeed, 44% of organizations surveyed suffered either ransom attacks or crypto-mining by cyber criminals looking for easy profits. What’s more, attack tools became more effective in the past year; the number of outages grew by 15% and more than half saw slowdowns in productivity. Application layer attacks—which cause the most harm—continue to be the preferred vector for DDoSers over the network layer. It naturally follows, then, that 34% view application vulnerabilities as the biggest threat in 2019. Businesses understand the seriousness of the changing threat landscape and are taking steps to protect their digital assets. However, some tasks – such as protecting a growing number of cloud workloads, or discerning a malicious bot from a legitimate one – require leveling the defense up. Security solutions must support and enable the business processes, and as such, should be dynamic, elastic and automated. Machine Learning: As hackers leverage advanced tools, organizations must minimize false positive calls in order to optimize the customer experience. This can be achieved by machine-learning capabilities that analyze big data samples for maximum accuracy (nearly half of survey respondents point at security as the driver to explore machine-learning based technologies). Automation: When so many processes are automated, the protected objects constantly change, and attackers quickly change lanes trying different vectors every time. As such, a security solution must be able to immediately detect and mitigate a threat. Solutions based on machine learning should be able to auto tune security policies. Real Time Intelligence: Cyber delinquents can disguise themselves in many forms. Compromised devices sometimes make legitimate requests, while other times they are malicious. Machines coming behind CDN or NAT can not be blocked based on IP reputation and generally, static heuristics are becoming useless. Instead, actionable, accurate real time information can reveal malicious activity as it emerges and protect businesses and their customers – especially when relying on analysis and qualifications of events from multiple sources. Security Experts: Keep human supervision for the moments when the pain is real. Human intervention is required in advanced attacks or when the learning process requires tuning. Because not every organization can maintain the know-how in-house at all times, having an expert from a trusted partner or a security vendor on-call is a good idea. It is critical for organizations to incorporate cybersecurity into their long-term growth plans. Securing digital assets can no longer be delegated solely to the IT department. Rather, security planning needs to be infused into new product and service offerings, security, development plans and new business initiatives. 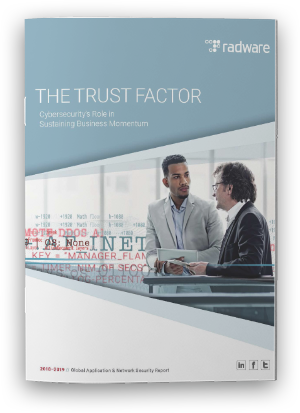 CEOs and executive teams must lead the way in setting the tone and invest in securing their customers’ experience and trust. Executives express mixed feelings and a surprisingly high level of confidence in Radware’s 2018 Web Application Security Report. As we close out a year of headline-grabbing data breaches (British Airways, Under Armor, Panera Bread), the introduction of GDPR and the emergence of new application development architectures and frameworks, Radware examined the state of application security in its latest report. This global survey among executives and IT professionals yielded insights about threats, concerns and application security strategies. The common trend among a variety of application security challenges including data breaches, bot management, DDoS mitigation, API security and DevSecOps, was the high level of confidence reported by those surveyed. 90% of all respondents across regions reported confidence that their security model is effective at mitigating web application attacks. Attacks against applications are at a record high and sensitive data is shared more than ever. So how can execs and IT pros have such confidence in the security of their applications? There were quite a few threats to application services that were not properly addressed, challenging traditional security approaches. In parallel, the adoption of emerging frameworks and architectures, which rely on numerous integrations with multiple services, adds more complexity and increases the attack surface. Last November, OWASP released a new list of top 10 vulnerabilities in web applications. Hackers continue to use injections, XSS, and a few old techniques such as CSRF, RFI/LFI and session hijacking to exploit these vulnerabilities and gain unauthorized access to sensitive information. Protection is becoming more complex as attacks come through trusted sources such as a CDN, encrypted traffic, or APIs of systems and services we integrate with. Bots behave like real users and bypass challenges such as CAPTCHA, IP-based detection and others, making it even harder to secure and optimize the user experience. Web application security solutions must be smarter and address a broad spectrum of vulnerability exploitation scenarios. On top of protecting the application from these common vulnerabilities, it has to protect APIs and mitigate DoS attacks, manage bot traffic and make a distinction between legitimate bots (search engines for instance) and bad ones like botnets, web-scrapers and more. 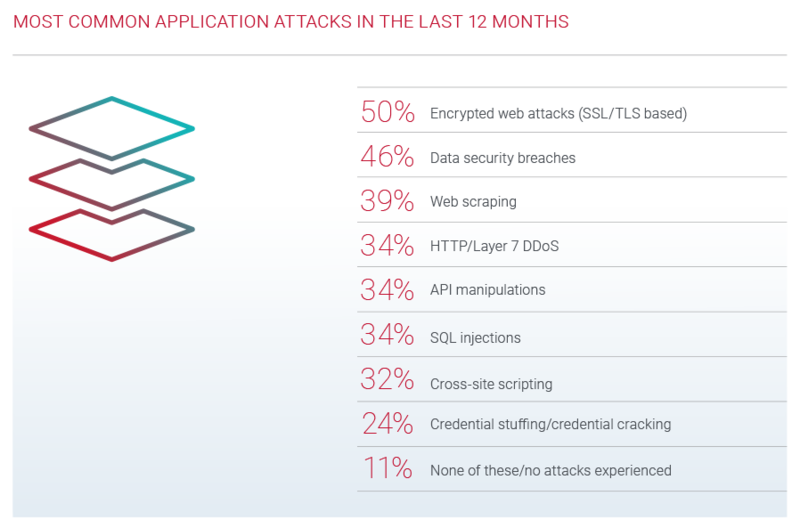 63% suffered a denial of service attack against their application. DoS attacks render applications inoperable by exhausting the application resources. Buffer overflow and HTTP floods were the most common types of DoS attacks, and this form of attack is more common in APAC. 36% find HTTP/Layer-7 DDoS as the most difficult attack to mitigate. Half of the organizations take rate-based approaches (such as limiting the number of request from a certain source or simply buying a rate-based DDoS protection solution) which are ineffective once the threshold is exceeded and real users can’t connect. The amount of both good and bad bot traffic is growing. Organizations are forced to increase network capacity and need to be able to precisely tell a friend from a foe so both customer experience and security are maintained. Surprisingly, 98% claimed they can make such a distinction. However, a similar amount sees web-scraping as a significant threat. 87% were impacted by such an attack over the past 12 months, despite a variety of methods companies use to overcome the challenge – CAPTCHA, in-session termination, IP-based detection or even buying a dedicated anti-bot solution. Multinational organizations keep close tabs on what kinds of data they collect and share. However, almost every other business (46%) reports having suffered a breach. On average an organization suffers 16.5 breach attempts every year. Most (85%) take between hours and days to discover. Data breaches are the most difficult attack to detect, as well as mitigate, in the eyes of our survey respondents. How do organizations discover data breaches? Negative consequences such as loss of reputation, customer compensation, legal action (more common in EMEA), churn (more common in APAC), stock price drops (more common in AMER) and executives who lose their jobs are quick to follow a successful attack, while the process of repairing the damage of a company’s reputation is long and not always successful. About half admitted having encountered such consequences. The rapidly growing amount of applications and their distribution across multiple environments requires adjustments that lead to variations once a change to the application is needed. It is nearly impossible to deploy and maintain the same security policy efficiently across all environments. Our research shows that ~60% of all applications undergo changes on a weekly basis. How can the security team keep up? While 93% of organizations use a web application firewall (WAF), only three in ten use a WAF that combines both positive and negative security models for effective application protection. Among the respondents that used micro-services, one-half rated data protection as the biggest challenge, followed by availability assurance, policy enforcement, authentication, and visibility. Is there a notion that organizations are confident? Yes. Is that a false sense of security? Yes. Attacks are constantly evolving and security measures are not foolproof. Having application security tools and processes in place may provide a sense of control but they are likely to be breached or bypassed sooner or later. Another question we are left with is whether senior management is fully aware of the day to day incidents. Rightfully so, they look to their internal teams tasked with application security to manage the issue, but there seems to be a disconnect between their perceptions of the effectiveness of their organizations’ application security strategies and the actual exposure to risk. Are Application Testing Tools Still Relevant with Self Learning WAFs? We all want to secure our applications. This task is becoming harder by the day as our applications constantly change multiple times per week, if not per day. According to Radware’s Web Application Security Report, 24% of the applications are changed on a weekly basis. Can Security Be Efficient Without Expertise or Intelligence? Threats evolve fast, don’t lag behind! I recently returned from a business trip to an exotic destination, which is also a massive emerging market depending on how you look at it. The folks I’ve met do not seem to face other challenges than what you see in mature markets, but I could easily relate to the sheer interest of people to learn and adapt and act quickly. They were keen to get knowledge and use it, knowing that without it they may stay behind. In today’s threat landscape, if you aren’t able to react quickly enough, you will suffer. An essential part of the technological evolution is creating systems, machines and applications that autonomously and independently create, collect and communicate data. This automation frees information technology folk to focus on other tasks. Currently, such bots generate more than half of the internet traffic, but unfortunately every evolution brings with it some form of abuse. Various ‘bad’ bots aim to achieve different goals, among which are web scraping, web application DDoS and clickjacking. While simple script-based bots are not much of a challenge to detect and block, advanced bots dramatically complicate the mitigation process using techniques such as mimicking user behavior, using dynamic IP addresses, operating behind anonymous proxies and CDNs, etc. Captcha means “Completely Automated Public Turing Test to tell Computers and Humans Apart”.